Now, before I begin, I must admit that my pancakes usually turn out terribly. I strolled into the kitchen yesterday morning with low expectations, deciding to do a bit of an experiment with random ingredients.... to my absolute delight these beauties turned out amazing, if I do say so myself! If you need more persuasion, these Apple Pie Theme Pancakes are: Vegan, Gluten Free, Low in Saturated Fat, Contain No Added Sugar, Are a Good Source of Protein, Contain Less Than 250 Calories and (most importantly) Delicious! Ready to make them yet?! 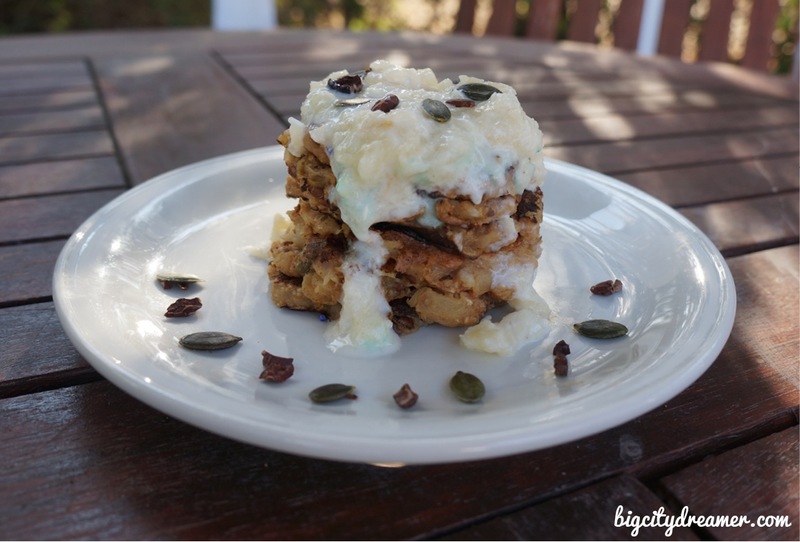 You will need: 1/4 cup oats, 1 medium apple (I used pink lady), 3 tbsp light soy milk, 1 tbsp flax seed, 1/2 tsp each natural vanilla extract, baking powder and cinnamon, small handful mixed raisins and pumpkin seeds. 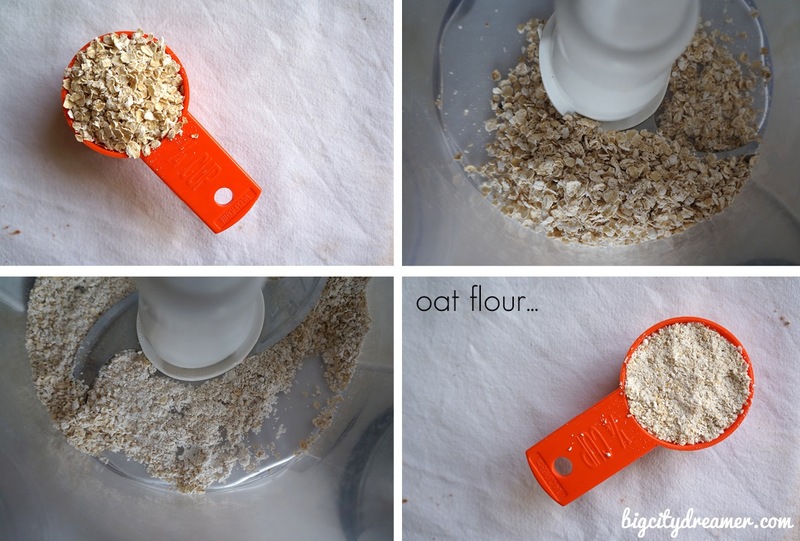 To make the Oat Flour: Grind 1/4 cup oats in a food processor. 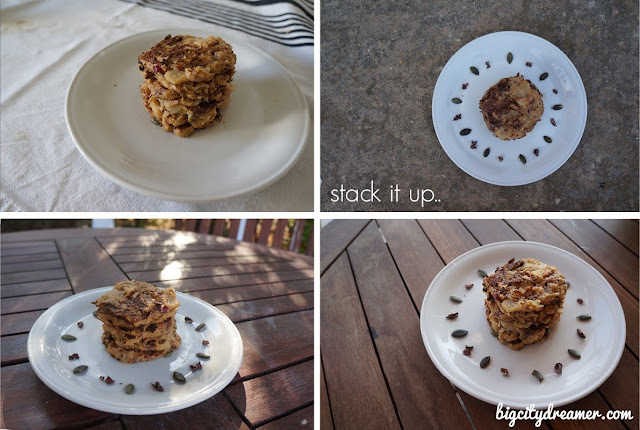 To make the Flax Egg Substitute: Blend together 1tbsp flax seed and 3 tbsp water, put through a sieve and scrape until a gel-like consistency is formed. 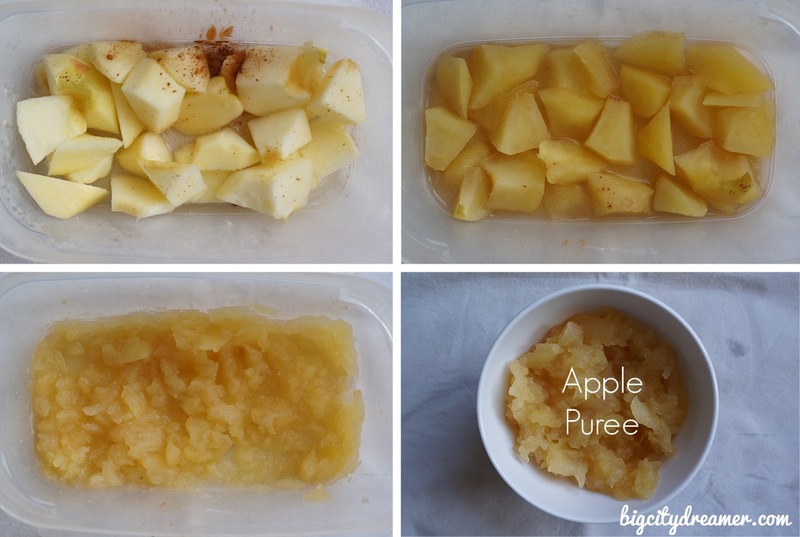 To make the Apple Puree: Core and peel the apple, cut into chunks and place in a microwaveable dish with a bit of water and sprinkling of cinnamon. Cover and cook for three minutes. Mash. 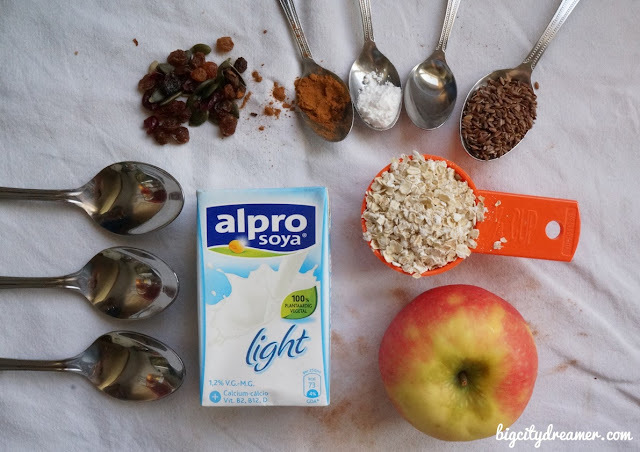 Combine: All the ingredients, using only 3tbsps of the apple puree. Add around 5tbsp water until a batter-like consistency is achieved. 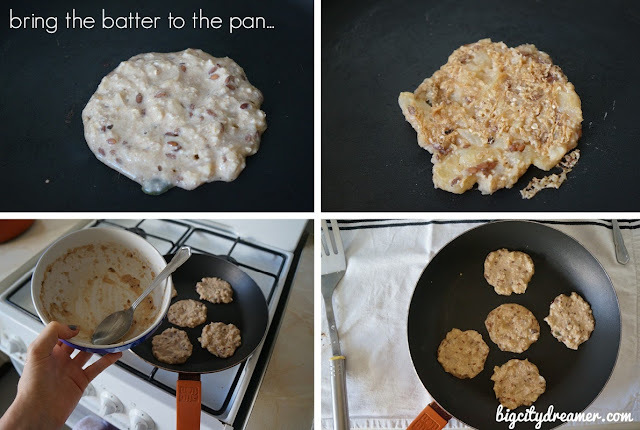 Bring to the Pan: Coat the pan with a bit of rapeseed oil and, once heated, add the pancakes, tbsp at a time, ensuring they are round in shape! Flip over once bubbles appear. Stack them Up: Stack up the pancakes on a plate and surround with cacao nibs and pumpkin seeds. To make the Topping: Combine the remaining apple puree and a tbsp soy yogurt along with a bit of water to thin it out. 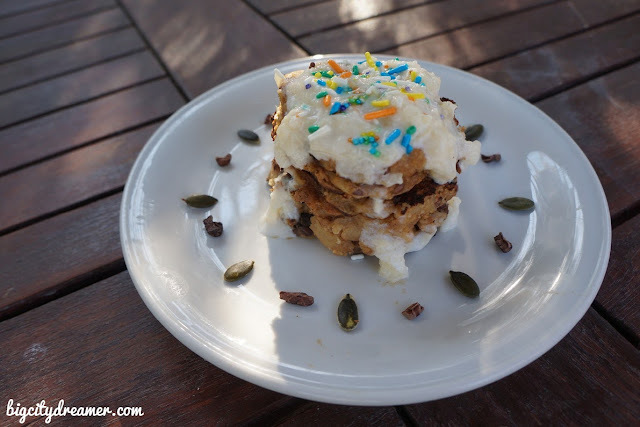 Add sprinkles if you're giving them to children to give them that 'these aren't healthy look' ...or if you're a big kid at heart (like me)! Or top them with nature's sprinkles: chopped nuts, seeds and cacao nibs. Drizzle over the pancakes. Add sprinkles if you're giving them to children to give them that 'these aren't healthy look' ...or if you're a big kid at heart (like me)! Or top them with nature's sprinkles: chopped nuts, seeds and cacao nibs. Nutritional Info (for whole stack of pancakes): 221kcal, 38g carbs (20 of which sugar - all natural from the apple and raisins), 7g protein, 5g fat (0.3 of which saturates). 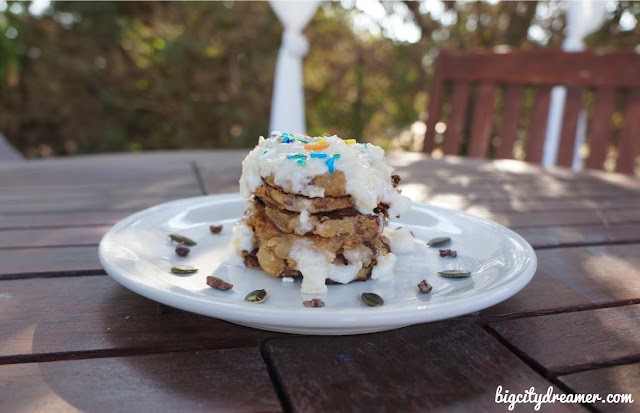 Are you a pro at pancakes? What's your favourite kind?! HI! 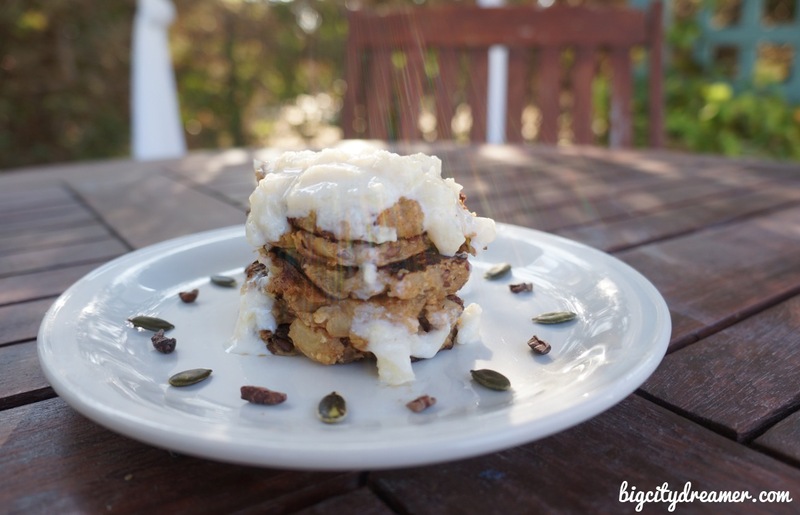 Can I use an actual egg instead of a flax egg? Also, can I use canned applesauce instead of the apple mash?